The purpose of the Occupational Safety and Health Act of 1970 (Public Law 91–596) is to assure safe and healthful working conditions for every working person and to preserve our human resources. In this Act, the National Institute for Occupational Safety and Health (NIOSH) is charged with recommending occupational safety and health standards and describing exposures that are safe for various periods of employment, including (but not limited to) the exposures at which no worker will suffer diminished health, functional capacity, or life expectancy as a result of his or her work experience. Current Intelligence Bulletins (CIBs) are issued by NIOSH to disseminate new scientific information about occupational hazards. A CIB may draw attention to a formerly unrecognized hazard, report new data on a known hazard, or disseminate information about hazard control. CIBs are distributed to representatives of academia, industry, organized labor, public health agencies, and public interest groups as well as to federal agencies responsible for ensuring the safety and health of workers. Titanium dioxide (TiO2), an insoluble white powder, is used extensively in many commercial products, including paint, cosmetics, plastics, paper, and food, as an anticaking or whitening agent. It is produced and used in the workplace in varying particle-size fractions, including fine and ultrafine sizes. The number of U.S. workers currently exposed to TiO2 dust is unknown. 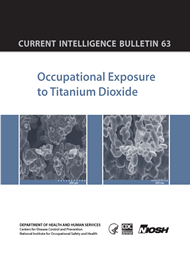 This NIOSH CIB, based on our assessment of the current available scientific information about this widely used material, (1) reviews the animal and human data relevant to assessing the carcinogenicity and other adverse health effects of TiO2, (2) provides a quantitative risk assessment using dose-response information from the rat and human lung dosimetry modeling and recommended occupational exposure limits for fine and ultrafine (including engineered nanoscale) TiO2, and (3) describes exposure monitoring techniques, exposure control strategies, and research needs. This report only addresses occupational exposures by inhalation, and conclusions derived here should not be inferred to pertain to nonoccupational exposures.